Parents are no longer able to ignore the billow of information on brain injuries associated with youth sports. We’re not just talking about concussions. Consider this, a Purdue research study compared changes in the brains of high school football players who had suffered concussions with the brains of players who were concussion free. They found brain tissue damage in both. Players who don’t appear injured, or concussed still suffered cognitive damage. These youth athletes aren’t symptomatic making them extremely vulnerable to withstand additional impairment. Recently, Pop Warner announced it will be doing away with kickoffs for its three youngest divisions. Starting this fall, the ball will be placed at the 35-yard line at the start of each half, and after each score in leagues with kids ages 5-10. Eliminating kick returns and reducing contact in practices are the latest steps by Pop Warner to decrease the number of hits sustained by elementary age children playing football. Ideally, that would include spot checks on teams to ensure coaches are enforcing the new rules. With the exception of U.S. soccer which announced children 10 years or under will no longer be allowed to head the ball in practice or games, head impacts go mostly unscrutinized in sports outside of football. college. (Very little is known about such in children who begin playing sports at the elementary level.) 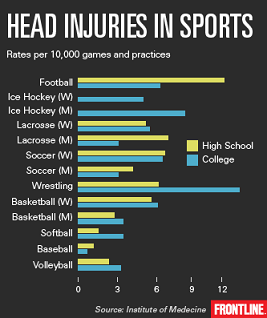 Soccer has the highest amount of head injuries for girls. Many experts attribute concussions in soccer to improper technique when heading the ball and poor neck strength. Looking at these numbers the steps taken by US Soccer are even more important. I’m not saying football doesn’t deserve its share of scrutiny in the concussion argument. However, when it comes to youth sports the conversation should widen to others with repetitive head impacts causing known and unknown traumas to the brain.